Put up your swords and engage in ultimate one-on-one combat in Nidhogg 2 as the highly rated sequel finally comes to Xbox One! Does it live up to the hype? Check out the trailer at the bottom to get a feel for the gameplay! My review will be broken down into three main sections: two involve gameplay (singleplayer and multiplayer) while the third will be focusing on the game’s technical side. 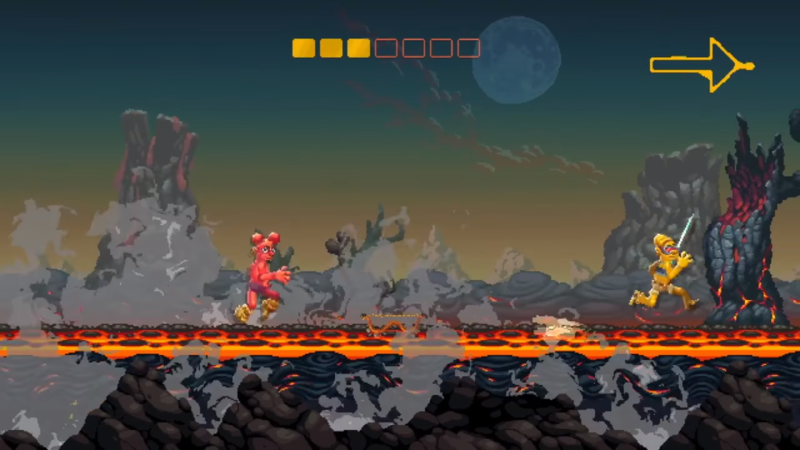 Nidhogg 2 contains a single-player mode called “Arcade.” Here, you can practice your skills over ten separate levels. Each level is a match that consists of many separate one-on-one duels: kill your opponent with a number of weapons and you’ll advance to the next screen. Fill all the boxes at the top with your colour (each box representing a new screen), and you’ve won the match. The game is as simple as that. I’ll get more into the little details about the matches and competitive nature later on, but for now, let’s look at the game from a purely single-player experience. This game really isn’t meant to be played as a solo player. Arcade seems like a hastily thrown together mode used to harness some skills and get experience on the maps. 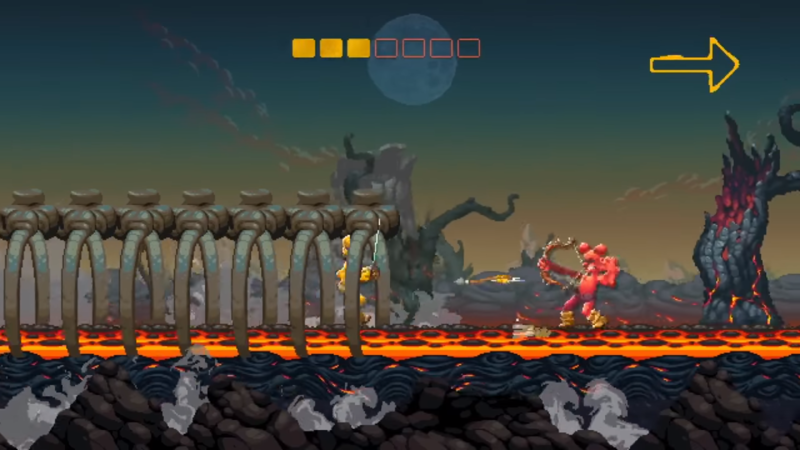 If you were only planning on playing Nidhogg 2 solo, you’d be sorely disappointed. I didn’t play the first game, but picked up on the gameplay and strategies very quickly, leading me to beat the entire singleplayer Arcade in only 55 minutes. Now, this is how it’s meant to be, as there is an achievement for beating the game in a mere twenty minutes, but if you’re looking for singleplayer alone this isn’t the game for you. I found the A.I. varied map to map: while I had trouble on level 4, I’d breezed through levels 8 and 9. There’s no escalation in difficulty other than the fact that I wasn’t very good with the bow and dagger (rapier for the win!). When it came to the Winter map, my journey through that level took up maybe 25 minutes of my 55-minute playtime, while the final levels only took maybe ten. It’s an inconsistent and quick experience, but it’s all setup and prep for the real meat of the game. Where Nidhogg 2 excels is in its multiplayer. There are two options for playing with others: local and online. Local multiplayer gives two options. The head-to-head, two-player versus mode and the more extreme tournament mode, which can be played with three to eight players. This is where the game shines, in my opinion. If you have willing participants, the fast-paced and competitive nature of each match is a rousing affair, swords flying and screaming heard echoed through my house in my brief dabble into the couch-pvp. The few hours I spent with various numbers of people on one console, vying for the wins at every turn was immensely fun and satisfying, and I’m glad to say Nidhogg 2 will be joining the likes of Speedrunners, Mario Kart, and 1-2 Switch as game party staples. Multiplayer also allows for customization of each match, allowing for each match to be different. Firstly, a time limit can be set on a match so that you don’t run into the stalemate I had on the Winter map in Arcade. When set to three minutes, it becomes a race against the clock as well. When time runs out, sudden death ensues, meaning whoever is left standing wins. Now there’s an element of trying to beat the clock so that all your hard work is for something. There’s also cheats that can be turned on. These are fun little settings that change gameplay. For example, low gravity is hilarious and changes the pace completely, while the “baby” mode (where you only crawl) is a funny, yet slightly painful affair. But even ignoring cheats, every match is different. I played one match where we were going back and forth to the very last screens, redeeming ourselves only to lose yet again. It was a long duel, but incredibly intense and fun. I played another match soon after against the same opponent that was over in mere minutes. Every game is different, especially when other weapons and maps are in the mix. Trying to disarm your opponent and making mad dashes to the next screen is what keeps you on your toes, but the close-knit and tense duels between friends are what made me fall in love with this game. 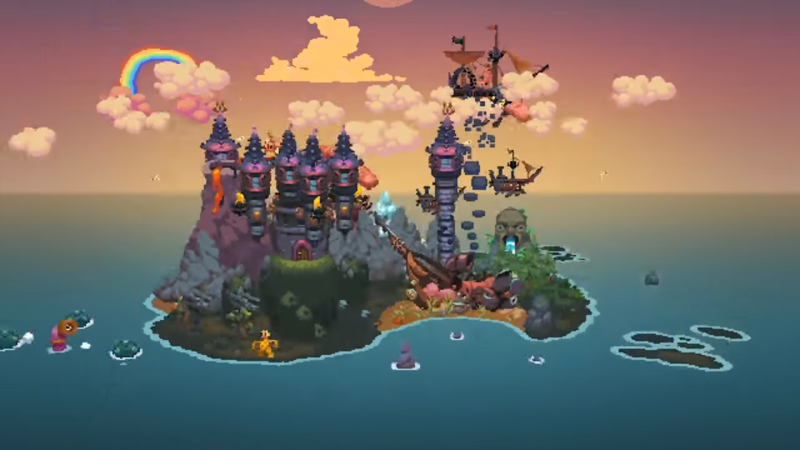 The variety given in multiplayer is what makes Nidhogg 2 so replayable. Every match is different, yet all are so fun and hilarious, yet so very competitive. As for online multiplayer… It appears as though the servers won’t come up until launch, so I won’t get a feel for it in the time I had to play before launch. I’d imagine it would be a midpoint between singleplayer and couch-multiplayer. While playing against friends over Xbox Live (and in parties) could be fun, playing online against random people would be no different than playing against A.I., unless there was a clever ranked mode with some rewards. That remains to be seen, and I’m judging Nidhogg 2 purely on what I’ve played. 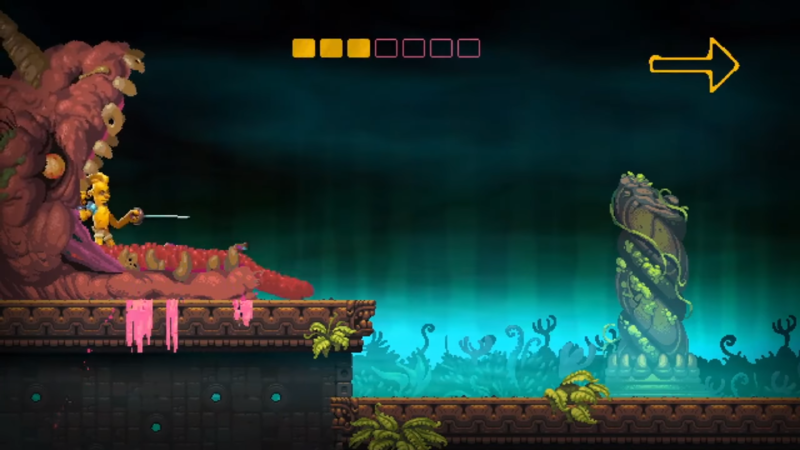 Finally, let’s quickly look at Nidhogg 2 from a technical level. Level design is engaging both from a gameplay and aesthetic. Each level is wildly different than the last, and each area has life breathed into the backgrounds and foregrounds. The music is great and never overbearing while setting the tone for each fight appropriately. Not even in my longer 25-minute fights in Arcade did the music get annoying, which is a good thing. There’s an excellent amount of variety in the weapons too. Four weapons to choose from all have their different pros and cons. The greatsword is slower but has a longer reach, the bow can be reflected back at you but allows you to fight at a distance. The dagger is fast, but you have to be very close. The rapier has a lunge and great disarming potential. There’s a variety in matching these weapons against each other, but also in matching them against another weapon. So going up against a rapier while you have a bow is different than if you had a greatsword. 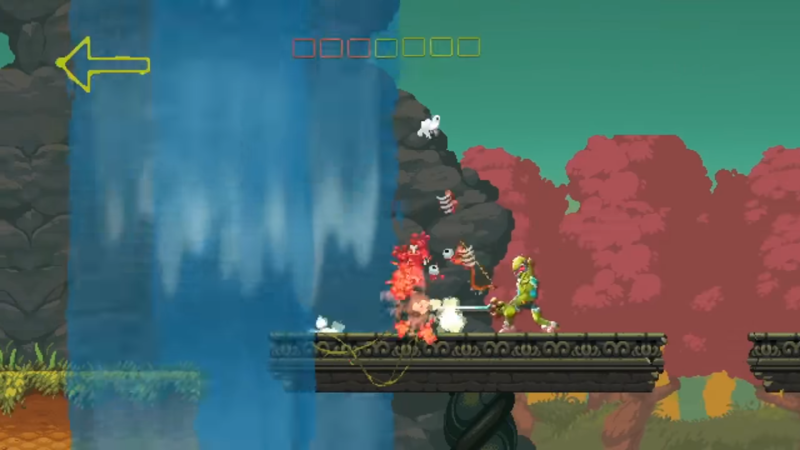 It all adds to the varied nature of the combat and is important in mixing up the game. If you’re an achievement hunter, like me, this game is really varied. Beating the game in twenty minutes could be difficult with the inconsistent difficulty, but I was able to get 250 gamerscore after only an hour. It seems as though some could be farmed in local multiplayer as well. They shouldn’t be that hard, save for one or two. At the end of it all, Nidhogg 2 is a fantastic multiplayer game and a so-so singleplayer one. There’s plenty of variety in the combat and matches that it offers up a different experience every time. 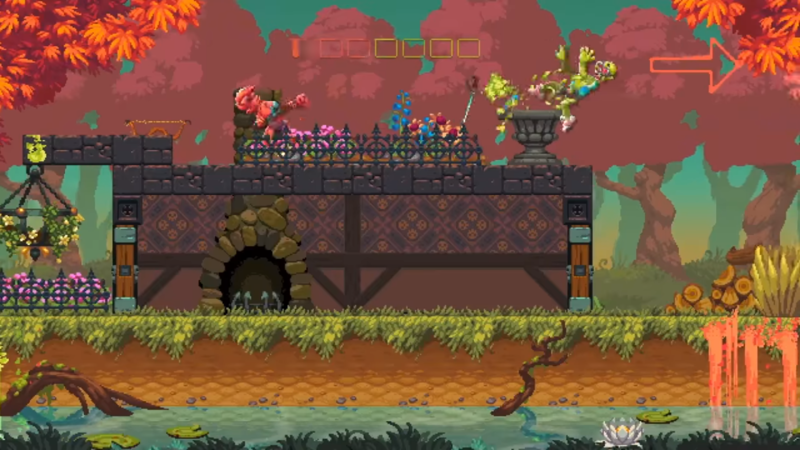 From all the screaming and yelling over each other during competitive couch sessions with buddies, it’s clear that Nidhogg 2 is going to be a staple at my house for a little while, and if it looks like you and your friends would dig it too, check it out. 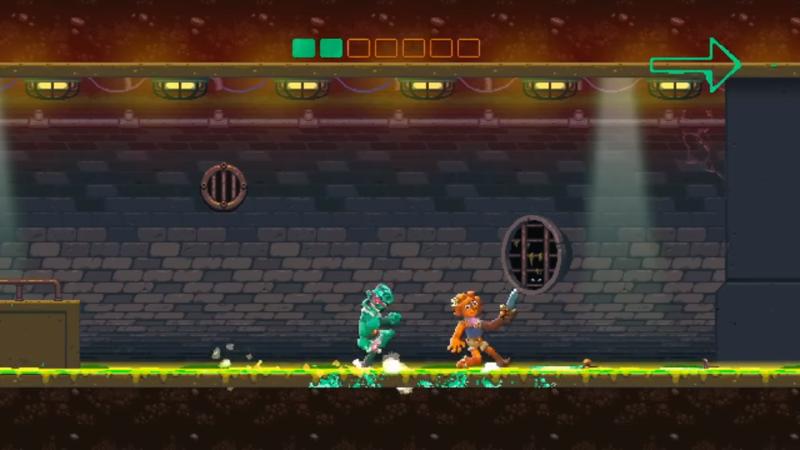 Nidhogg 2 is available tomorrow on Xbox One and is already out on PS4 and PC. Also, don’t sleep on the soundtrack.